I was really looking for the Sani-Cream / Henny Penny building on a Halloween afternoon in 2009. It was just a coincidence I knocked off a couple frames of the Campbell Mattress Company at 3 South Hanover. I didn’t realize the mattress company had been in business since 1933. May 28, 1935 – Fire destroyed Campbell Mattress Manufacturing Co. plant at 29 South Spanish. Fire was caused by burning bales of mattress cotton. 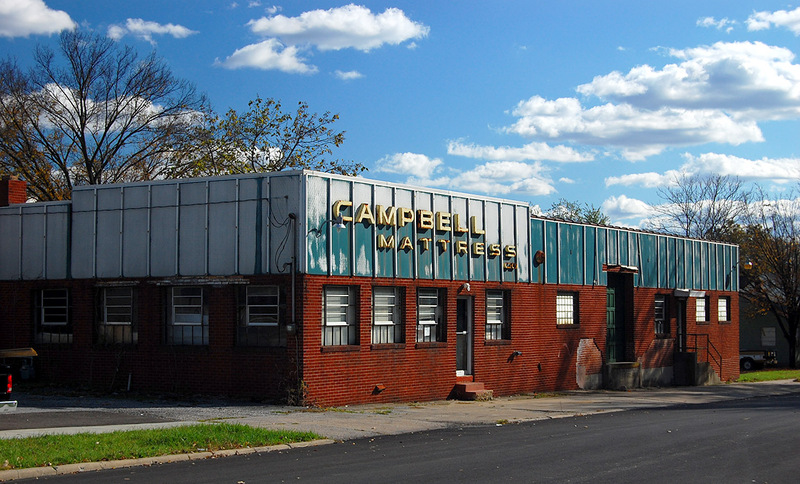 December 31, 1941 – Campbell Mattress was one of Cape’s leading manufacturing plants during the year. The shoe factory was the largest employer, with 1200 to 1400 workers. December 7, 1955 – Common Pleas Judge J. Henry Caruthers, who served on the bench longer than any of his predecessors in the 104-year history of the court, died December 6, 1955. He and his brother, W.P. Caruthers, established the Missouri Mattress Manufacturing Co. before selling it to W.T. Ruff and Lee James. 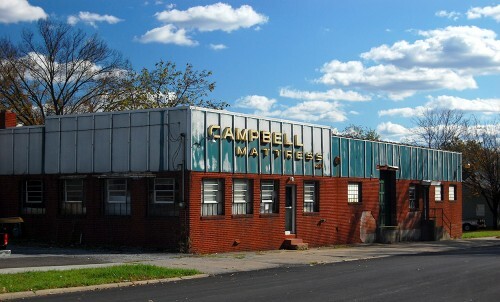 The Campbell Mattress Co. at 6 South Hanover is a successor to the original factory, and occupies the building erected by Judge Caruthers and his brother. September 30, 1987 – Manuel G. Campbell, 79, died September 29, 1987. 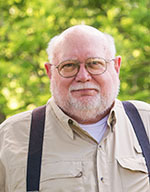 He owned and operated Campbell Mattress Co. from 1933 until 1983, when he sold the business and retired. March 18, 1994 – Sprinkler system prevents serious blaze at mattress company. August 5, 2000 – Fire at Campbell Mattress Co. warehouse at 100 Minnesota St. caused estimated $375,000 damage. When we got married in 1970 we bought a bedroom set and a Campbell king size mattress from Hutson’s Furniture. We slept on that mattress and moved it 7 times. We still have that mattress and I prefer it to the “new” one we got several years ago. Wish I could get a Campbell mattress out here in MT. That was a product that lasted and was well made, unlike the products of some big name companies that might last 5 years if you are lucky! 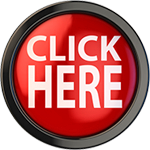 I can’t help but wonder how many hours your other readers wile away going from link to link on your blog. Today’s posting took me back to the Donut Drive-in (Dixie Creme)on Independence. Krispy Kreme and Dunkin are not any better, if as good. I was not aware that shop was at one time owned by Earl Kirchoff before he was in the insurance business. What your younger(your age)readers probably don’t remember is the little hole-in-the- wall Dixie Creme shop that Earl had down on Independence just off Main Street between Main and Spanish. My mom, Norma Ervin, and my uncle, Elmo “Bud” Maevers, worked for him in that shop. I don’t recall the stores facing Main and Spanish, but I believe what was the little donut shop was walled up and eventually incorporated into one of those stores. Now I want one of jelly filled items!! 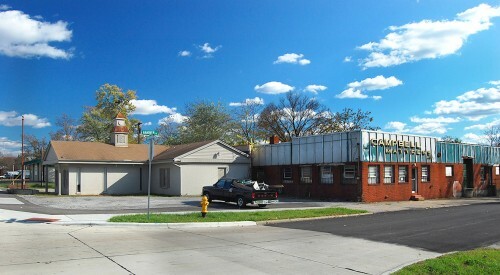 And then there was Tastee Donuts, 1201 Broadway near Henderson. I worked there in 1972-73, at which time a dozen glazed sold for 99 cents. For a while it was called ‘Mary Lee Donuts’, then briefly became a 50s style ‘diner’, before it’s current incarnation as Imo’s (ugh!) Pizza. PS: How can a chain like Imo’s compete with the ‘descended directly from heaven’ Pagliai’s Pizza, barely a stone’s throw down the block?? Some folks love Imo’s pizza, but the one time I ordered one, I was half-way through it before I realized I was eating the box, and it turned out to be better than the pizza. PS: I’ve always wondered how a chain like Imo’s can compete with the ‘descended directly from heaven’ Pagliai’s Pizza just a stone’s throw down the block. The Campbell Mattress building has now been torn down. Previous PostPrevious Need a Good Used Van?